LCD Control/Driver IC (PT16511) - Princeton Technology Corp. 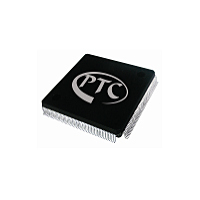 The PT16511 is 1/4 duty general-purpose LCD driver that can be used for frequency display in electronic tuners under the control of a microcontroller. The PT16511 can drive an LCD with up to 140 segments directly. The PT16511 can also control up to 4 general-purpose output ports.